SUMMARY: Seventeen-year old Althea holds her family's financial future in her hands. Beautiful, smart, and ambitious, Althea believes if she marries well, she will have the financial means to restore her family's crumbling clifftop castle. When young Lord Boring moves in with his aunt, Althea knows the handsome Lord Boring is her ticket. Can Althea overcome lack of food, mounting castle repairs, competing stepsisters, and a smart-but-incredibly-rude boy in time to win Lord Boring (and his fortune) for herself? 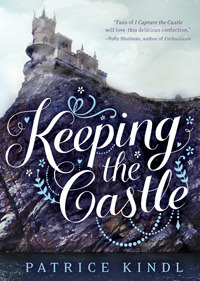 REVIEW: As a kind of Pride and Prejudice for teen readers, Keeping the Castle is a cute, fun romance that I really enjoyed. Althea's exploits to win Lord Boring's heart were endlessly entertaining and at times, quite hilarious. I loved all the characters and felt especially sorry for poor Lord Boring, who seemed to have no clue just how important he is to the desperate women of Lesser Hoo. I love Miss Vincy's unconventionally independent spirit and Prudence and Charity's vain selfishness. Though he lacks the social mores of his time, Mr. Fredericks is especially endearing. I love the slow-building friendship between Fredericks and Althea. Very nice. My only complaint with Keeping the Castle is the way it is written. While the writing style is elegant, beautiful, and fits the historical period, I fear that it may turn off some teen/tween readers who have had little exposure to the language of the Victorian period. Then again, I suppose Keeping the Castle will give them their first opportunity to try it out! THE BOTTOM LINE: Cute, fun, entertaining. It's a great choice for the 2013 Lone Star Reading List. STATUS IN MY LIBRARY: On order. Maybe not for every student, but I'll be recommending it frequently. Maybe not for every student, but definitely for ME. I read Smith's I Capture the Castle and rather enjoyed it.